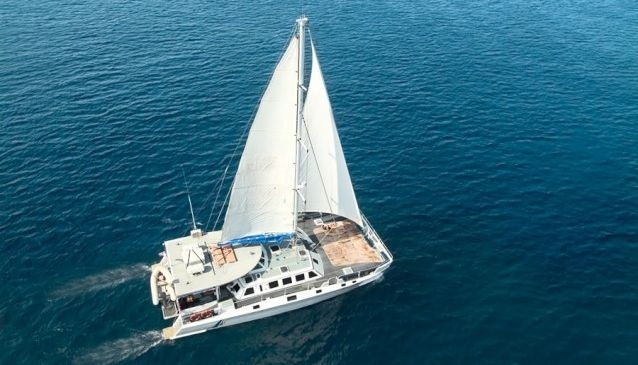 Sail from Bali to Nusa Lembongan Island aboard Aristocat - Bali Hai Cruises' luxury Catamaran. Enjoy a day trip or overnight stay in pristine Lembongan Bay at Bali Hai Cruises private Beach Club, where you can relax on golden sand, lie back in the shade of tranquil gardens or cool off in a lagoon pool. On board you receive complimentary refreshments. On arrival at the Hai Tide Beach Resort, you enjoy a delicious BBQ lunch grilled at the poolside cabana - salads, steaks and fresh fish. After lunch, join a guided village tour of this small unspoiled island, and Nusa Ceningan, home to seaweed farmers. On offer is an array of water sports activities: banana boat rides, pool volley ball, snorkelling and semi-submersible coral viewer, a parasailing adventure for a birds' eye view of the island and scuba diving with our in-house dive team - Bali Hai Diving Adventures. Certified divers may travel further to experience life beneath the waves in this vibrant ocean channel between Nusa Lembongan and Nusa Penida. Returns at 6:00pm (sunset).